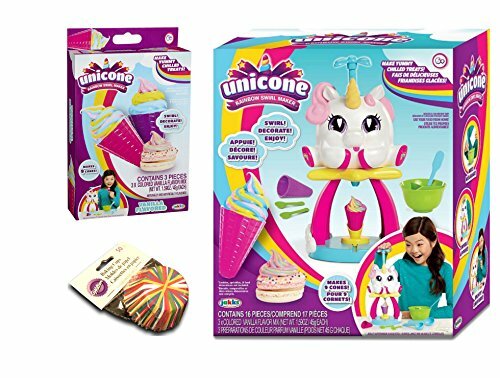 The Unicone Rainbow Swirl Maker is the only unicorn-shaped chilled dessert maker! Girls ages 6 and up will love mixing up the chilled dessert and creating the perfect rainbow swirl every time. It's the only chilled treat maker delivering its tasty surprise through the magic of a unicorn! It's a great gift, easy to make, and fun for the whole family. Use it to top cupcakes and cookies. Recipe cards provided so you can even use ingredients from home to make your own treat! The delicious dessert is a vanilla-flavored mousse style treat. Makes 9 cones! 16pc set includes: Unicone Rainbow Swirl Maker, 3 mix packets, 1 bowl, 1 spatula, 2 measuring spoons, 1 sprinkles horn, 2 recipe cards, 1 dispenser, 2 reusable cone with 2 spoons. Designed for kids ages 6+. Delivering its tasty surprise through the magic of a unicorn! Recipe cards provided so you can even use ingredients from home. Comes with 50 Wilton baking cups to serve or use for cupcakes. If you have any questions about this product by Unicone & Wilton, contact us by completing and submitting the form below. If you are looking for a specif part number, please include it with your message.